With a controversy surrounding his three-day-old appointment, senior Congress leader Kamal Nath on Wednesday night quit as party in-charge of poll-bound Punjab in view of a "canard" regarding the 1984 anti-Sikh riots. He wrote a letter to Congress President Sonia Gandhi who immediately accepted his resignation and relieved him of his charge as party General Secretary. Nath, who was appointed as the General Secretary in-charge of Punjab as well as Haryana only three days back, said in his letter to Gandhi, ".. I request that I may be relieved of my charge (of Punjab) to ensure that the attention is not diverted from the real issues facing Punjab." The former union minister said he was "hurt by the developments of the past few days wherein an unnecessary controversy has been created around the tragic 1984 riots in New Delhi." His step came as the Akali Dal, the Bharatiya Janata Party and the Aam Aadmi Party had kept up attack on him and the Congress over his alleged role in the anti-Sikh riots which followed the assassination of Indira Gandhi. Describing his appointment as 'sprinkling of salt on wounds' of Sikhs, the three parties were set to rake up the issue in the run up to the Assembly polls slated next year. Kamal Nath insisted that there was not even any public statement, complaint or FIR against him till 2005 in the riots case and that he had been absolved subsequently by the Nanavati Commission set up by the previous National Democratic Alliance government. "This canard is therefore nothing but a cheap political ploy to gain traction ahead of the elections.... Certain elements are raking up these issues now only for political gains," he wrote to Gandhi. Expressing gratitude to Gandhi for appointing him as General Secretary in-charge of Punjab, the Congress leader wrote, "I am practitioner of Nehruvian politics and maligning of the Congress party using false accusations is unacceptable to me." "I wish the party to focus on the upcoming elections and highlight the issues of misgovernance, misery of the farmers and youth, break down of law and order and rampant drug trade that caused untold misery to the people of Punjab." Soon after, party spokesman Randeep Surjewala said the Congress president had accepted Nath's resignation as All India Congress Committee General Secretary. 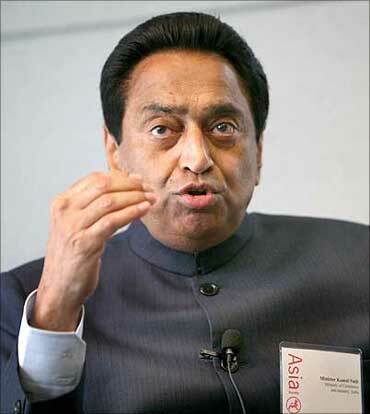 "Kamal Nath has tendered his resignation from the responsibilities assigned to him in AICC. On his request, Congress president Sonia Gandhi has accepted his resignation," Surjewala said. In his letter, Kamal Nath said he has been blessed to have a long career with the Congress right from youth Congress to being general secretary to being a minister in the party's governments since 1991 and "never has there been any stigma attached to my name." "It was not even an issue when I was general secretary in charge of Delhi, rather we won the MCD elections during my tenure," he said. "Till 2005, not a single public statement, complaint or FIR was ever made against me and the first time my name was ever mentioned in any forum was 21 years after 1984," he wrote. The Nanavati Commission set up by the previous NDA government "after proper investigation fully absolved me", he added. "Even during a subsequent motion, to discuss the commission's report in Parliament, none of the AKali-BJP MPs including Sukhbir Singh Badal mentioned my name," he said.